A man passes a Gucci shop in central Bucharest on February 7, 2017 in Bucharest, Romania. It could all be so simple... but apparently, some luxury brands are intent on making it harder for themselves. Instead of hiring diverse teams, listening to members of their staff who raise red flags about potentially offensive merchandise, or considering the full breadth of consumers who may be shopping for or viewing their products, more and more labels are being forced to lose money on already-produced merchandise. In December, Prada was forced to remove several accessories from their collection after outcry about several monkey-themed items closely resembled racist caricatures. Now, fellow Italian label Gucci is apologizing for a balaclava-inspired black turtleneck with a vivid red trim around its cutout mouth. Though the model wearing the sweater in ads was white, critics quickly cried foul, pointing out the strong similarities to blackface imagery in the design. Not surprising, since while blackface may not be a current cause for concern in Italy, it is at the forefront of a major cultural conversation in America—now including a growing gubernatorial scandal in Virginia. And honestly, a nearly 100-year-old brand should simply know better. Instead, they found themselves issuing a formal apology. But is the sweater itself really racist? 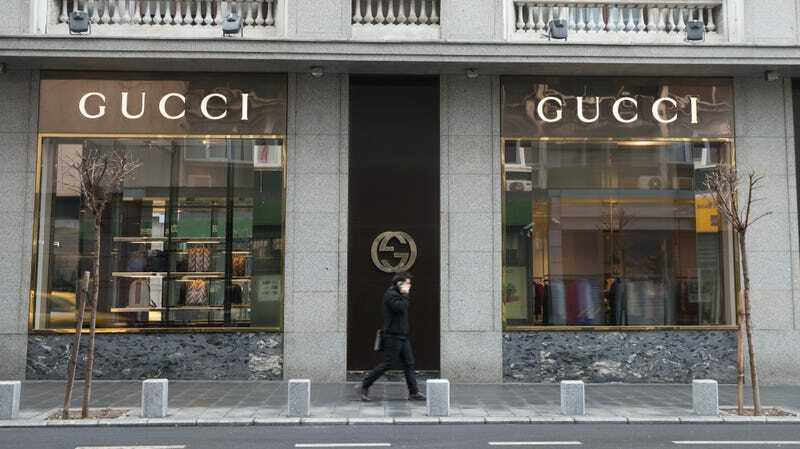 We’re guessing it never even occurred to Gucci’s design team, marketers or the many others who were involved in the approval process that what they likely considered an “edgy” design would have deeply racist connotations. In fact, we doubt they ever considered us at all—and that’s really the most racist element here, in our opinion. Also offensive is the fact that, despite a partnership with Dapper Dan once again giving Gucci black cultural cred, there are seemingly no—or very few—black people within the higher ranks of the label; black talent that might’ve very well checked this before it even left the sketch phase. [P]eople want respect because now there is talk of cultural appropriation, but this is the foundation of fashion, as it has always been the basis of art, of everything. ... Those who are offended are offended, so I don’t know how we can solve this problem. Surely, I feel like not saying anything, not doing anything, so I don’t have any problem. Because then the famous web hate is massive. Or, people just want to feel respected, and you should’ve just sat there and made your clothes, Miuccia. Compounding the issue of design “freedom”—and the likely lack of designers and higher-level execs of color at these labels—is the question of who Gucci, Prada, or any other brand that has found themselves caught in the crosshairs of these conversations envisions as their clientele. Both Gucci’s design and ad lead me to believe they never considered for a moment how any black clientele might feel or look in this sweater. It’s a cultural blindspot that can simply no longer be ignored. In addition to that, Gucci’s sweater is just plain ugly (as were Prada’s trinkets, in our opinion), which is offensive, in itself. But until labels decide they want both their teams and clientele to come in all colors, this is bound to keep happening. Because really, it could all be so simple. “Am I offending someone?” Prada asked, complaining to WWD about the process of *gasp* cultural consideration she now has to undergo when readying a new collection. (Poor lil’ tink tink.) “[C]ould it be read as an offense?” she added. We’re glad you asked, Miuccia. Forgive us if we don’t sympathize with your burden; we have our own. But somehow, we also think you all just love the free publicity.